The GM10 guitar mic is a unique new addition to the sE range, designed to solve an age old problem in micing acoustic guitars for studio recordings. There is always a trade off when recording, between the need to stay still in front of the mic to avoid changes in the sound of the instrument as it’s recorded, and the need for the performer to get an ‘emotional’ take. The two requirements don’t sit well together and this often leads to recorded takes sounding too clinical… too ‘perfect’ and lacking the performance element that often makes a song. “We nicknamed this mic “the voice of God.” Omnipresent is not an overstatement. It’s a huge sound, bold, rich and deep with fantastic representation of detail and a shimmering yet substantial high end. 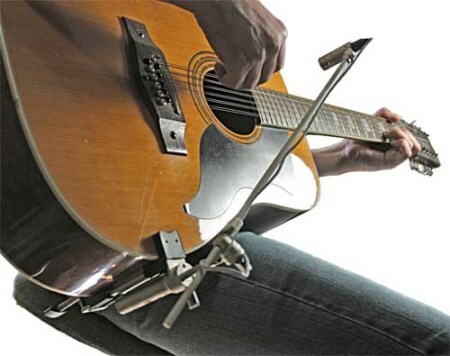 It gets mounted to the guitar with a clever arm and shock mount, which incorporates the XLR connector. It takes a little time to get it on at first, and then it takes some getting used to as it restricts movement just a bit. But this mic is always in the sweet spot when you’re on stage or recording, and it sounds phenomenal either way. “The sound of this small fixed cardiod mic is fantastic, in comparison with a conventional large diaphragm mic; it was quickly noticeable how well it captured the high frequencies and its off-axis response really gives a very natural sound with plenty of harmonics from the guitar. I really have to take my hat off to SE Electronics for the approach it seems to have with its hand-built mics. The GM10's ergonomic design and clever thinking will certainly will make life much easier for recording high quality acoustic guitars with a minimum of fuss. The GM10 incorporates the world’s smallest gold sputtered mylar capsule at 17.1mm, along with a proprietary shock mount assembly built into the capsule head. A universal clamping system enables the user to fix the mic in place (on any flat backed acoustic guitar) so the condenser capsule is perfectly placed top record take after take from exactly the same position. The clamping mechanism and shock mount ensure that there is zero mechanical noise transferred through the guitar body. This allows the user to capture a perfect recording every time, while still being able to move around freely, which encourages the performer to give their best on a take. The Guitar Mic really does transform recorded performances of acoustic guitar, and the way you work in the studio.